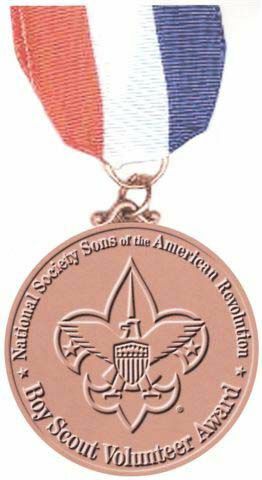 The Robert E. Burt Boy Scout Volunteer Award is the name for an award for Scouters of the Sons of the American Revolution. It is an honor due to members of the SAR who act as role models and provide dedicated service to the young men in the Boy Scouts of America (BSA). The Robert E. Burt Boy Scout Volunteer Award acknowledges the service of the recipient to Scouting and is awarded by the National Society, Sons of the American Revolution. The award consists of a medal with ribbon (shown below), miniature medal, a certificate and a BSA Community Organizations Award square knot (shown above). The award will be presented to a member of the SAR in good standing who is currently active in a scout unit, district, or council or a member that has displayed outstanding dedication to the Scouting Program. Work accomplishment and dedication rather than a specific number of years in Scouting, will be the criteria for this award. Have brought Scouting to more youth. Have assisted local chapters in forming Scouting units. Are fully trained in the skills of Scouting and are outstanding role models. Have contributed significantly to the SAR and Scouting by bringing the two movements together to serve the community. Have offered Scouting to all youth regardless of race, creed, or income level, and has been instrumental in organizing Scouting units, especially in inner-city or other low-income communities. Have exemplified the Scout Law and SAR virtues. Candidates must have the recommendation of their local chapter to be eligible. The nominee must be recommended by a current member of the SAR. The recommender must complete the Official Nomination Form and submit an attached page explaining the candidate's qualification for the award. The recommender is to have the form approved by the local SAR and local Scouters as being supportive of Scouting. The recommender should then have the Form reviewed by the President of the candidate's chapter. If found to be qualified, the Form will be authorized and forwarded to the chapter’s state society. The state society will then forward the Form to the chairman of the national society Eagle Scout Committee. The national society committee will, on an annual basis, forward the information on awardees to the Boy Scouts of America, Relationships Division, as an official record of the recipients. The award will be presented at an appropriate ceremony of either the SAR or the Boy Scouts. Detailed information about the award, and the Nomination form may be downloaded by Clicking here.